Enter Luxury Chocolate Heaven with Our Sweet Savings! Everyone loves sweets and chocolates on their birthday or for Christmas or just simply for a 'thinking of you' present! But it isn't half hard finding something away from the usual high street chocolate bars and boxes of chocolates! Why not put a smile on someone's face and really make their mouths water with a very unique box of chocolates of sweets which they have certainly never see before! Shop with My Favourite Voucher Codes and you'll get a sweet gift for a sweet price! 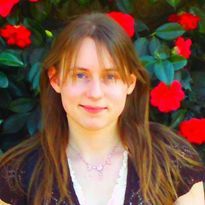 Chocolate Trading Company is a very good place to start for a fantastic selection of the most popular birthday chocolate gifts. From chocolate gift boxes to wonderful chocolate hampers, Chocolate Trading Company is chocolate gift city! There's even a free gift message with every chocolate order made online or you can even choose your own greeting card design for just £1.95! Chocolate gifts are great, but 'personalised' gifts are even better! 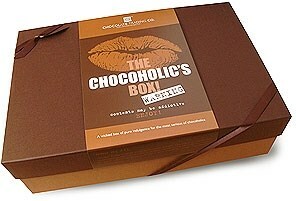 For starters, ho w about a Chocoholics hamper? 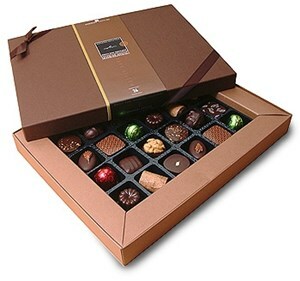 A whole box of highly addictive, LUXURY milk and dark chocolates. Finished with a gorgeous wrap and ribbon. Created...it's all in the presentation! For a tasty £34.95, don't wait! Grab a Chocolate Trading Company promo code and make your deal even better! Buying for a few people or one serious chocoholic? Get a brilliant bargain and buy in bulk with this Superior Selection, the Ultimate Chocolate Hamper ... even if you want to split the hamper up and give these luxurious bars as separate gifts, for just £59.95 for all of this luxurious, solid chocolate, don't miss out. This isn't called "superior" for nothing! With one of our discount vouchers who says luxury has to be expensive? When it comes to rich chocolate, quantity certainly isn't everything, but quality is! These mouth-watering, taste bud-tingling Charbonnel et Walker milk chocolate truffles would make the perfect addition to any present... and these aren't just ordinary truffles, these are milk chocolate truffles with a soft ganache centre infused with a dash of vodka! Irresistible! Quality chocolate for just £9.75. 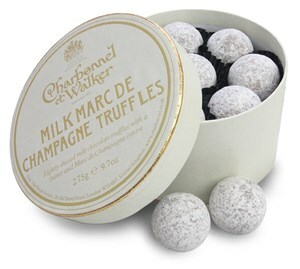 Or for a lovely variation of the above, try these Charbonnel et Walker Dark chocolate Champagne truffles...dark chocolate truffles with Marc de Champagne and dusted with cocoa powder! Again, just £9.75! You'd be hard-pressed to get two chocolate desserts for that and here's a whole box for under £10! As if Charbonnel et Walker hadn't spoilt you for choice enough already...why not try them all! 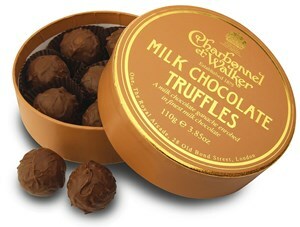 These Charbonnel et Walker Champagne truffles have a very generous butter and Champagne, milk chocolate ganache centre. You certainly won't be eating the whole box in one go! You can't say fairer than £18.95 for a 275g box! When it comes to chocolate, there's really nothing like having a decent choice! This Superior Selection dark chocolate gift box - 24 Box is again called 'superior' for a reason! A gorgeous selection of mostly dark chocolates which have been chosen for their purity of ingredients and outstanding flavours. Such a delicious display, you almost want to take a photograph! For just £22.99, priceless is the word! Chocolate is an art in itself. These Booja Booja Champagne Truffles (Artist) are not only gorgeous chocolates but they are also presented within a handmade gift box created from paper maché and beautifully decorated. Don't just give great rich chocolates, give rich chocolates in luxurious wrapping! These Champagne truffles are even vegan, dairy and gluten free! - and just £24.95! The chocolates might be rich but you don't have to be with a Chocolate Trading Company discount code! With a Chocolate Trading Company promo code, you can save 8% on all orders excluding sale items or even better, save up to 50% off chocolate with short dates! Always get great deals by downloading our brand new money saving app... never pay more unnecessarily again!